Someone once said to me, “The most convincing lies are the ones we tell ourselves”. I had a reason to think about this the other day when I was looking at some of the monthly numbers in a few of our online businesses and noticed something interesting about a particular web property that one of our clients owns. This client is spending a disproportionate amount of money on video. They are trying to build out a YouTube channel and are doing a bunch of Facebook Live on a regular basis. Over the past twelve months, they’ve shifted large portions of their efforts and marketing spend to video over everything else. The problem is, the numbers don’t justify the continued spend. Their video strategy isn’t working. It’s not driving leads and it certainly isn’t driving sales. Their YT channel isn’t really growing and FB Live engagement is declining rather than growing – in fairness, we’re seeing FB Live and video engagement falling across numerous clients at the moment. As a result of this change in marketing spend, channels that were working before have started to stagnate or decline. Their email marketing frequency has declined which has resulted in lower sales and their organic traffic growth has slowed as they’ve stopped doing outreach and reduced their new content spend. I had a quick conversation with the client on the weekend and gave them some free advice – video wasn’t working and they needed to redistribute some of their marketing spend back to channels that were previously working but were being strangled because of the change in strategy. One point I’d make is that the client isn’t a content client of ours so we have no dog in that fight – we get paid the same amount irrespective of where the marketing spend goes. As we were discussing it, the conversation evolved into less about results and more how this video strategy made them feel. They believed that this business made them look more legitimate to their clients and positioned their business well with a more upscale and better market. I quickly realized that we weren’t having a discussion about what was best for their business, but it was really about them continuing to believe the lie they had been telling themselves for the last year. They want to believe the lie. When all of the evidence, data and subsequent advice tells you that something isn’t working and you continue to pursue it anyway, then that’s you wanting to believe the lie. This is pretty common, if you go back to my opening statement, “The most convincing lies are the ones we tell ourselves” you’ll realize what I was talking about. We’re all guilty of this at various points in our businesses. For me, this happens when I think about starting something new – I get super optimistic and I think about all of the upside while downplaying the downsides. 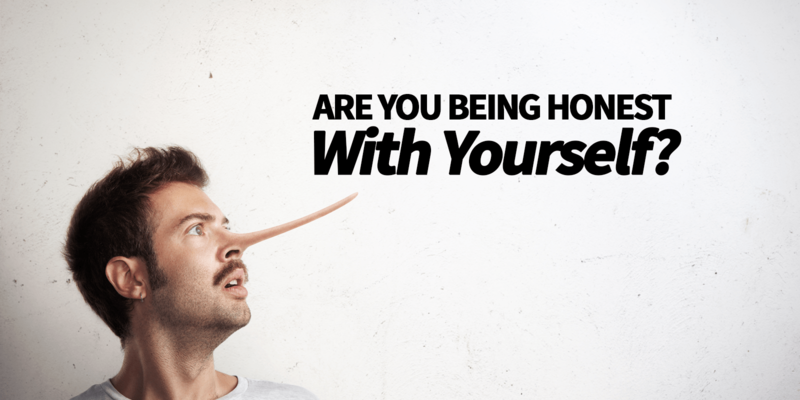 You’re sitting there thinking, “Yeah, I do the same” and it’s true, we all tell ourselves these lies, but the problem becomes when we start to believe them. You need to make sure that you don’t lose that kind of perspective. It’s ok to “want” to do things because you enjoy them or even if you believe in them, but when all of the available data and evidence says it’s not going to work, then you need to be realistic with yourself. If you’re struggling with perspective, find someone to talk to – that could be a group of peers or even get yourself a coach or mentor to work with you to provide that perspective. If you’d like to work with me in a business coaching capacity, just reply to this email, let me know and I’ll be in touch in a day or two.